Tingatinga (also spelt Tinga-tinga or Tinga Tinga) is a painting style that developed in the second half of the 20th century in the Oyster Bay area in Dar es Salaam (Tanzania) and later spread to most East Africa. Tingatinga paintings are one of the most widely represented forms of tourist-oriented art in Tanzania, Kenya and neighboring countries. The genre is named after its founder, Tanzanian painter Edward Said Tingatinga. 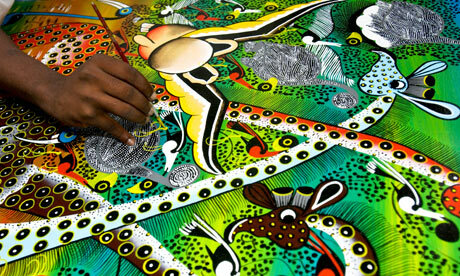 Tingatinga paintings are traditionally made on masonite, using several layers of bicycle paint, which makes for a brilliant and highly saturated colors. Many elements of the style are related to requirements of the tourist-oriented market; for example, the paintings are usually small so they can be easily transported, and subjects are intended to appeal to the Europeans and Americans (e.g., the big five and other wild fauna). In this sense, Tingatinga paintings can be considered a form of "airport art". The drawings themselves can be described as both naïve and caricatural, and humor and sarcasm are often explicit.